You are here: Home / Headphones / The Best Noise Cancelling Headphones… Bose or Sony? Needless to say that whatever equipment’s you use to measure the performance of headphones and whatever technical jargon you can tell for each headphones, finally its a subjective matter and each person will perceive the same headphone differently … So someone who really loves Bose signature sound which is really more towards neutral and true mostly may not like the Sony high Bass from XM3 .. anyway lets see comparing both one by one feature-wise and technical specs too. Lets begin with comfort and then dive into the sound and call quality to determine which one is best sounding out of the two. There are two important points for any headphone .. one is weight of headphones and other is comfort for long duration listening .. In terms of weight the Sony XM3 (254 grams) are bit heavier than Bose QC35ii (232 grams) – only for reference I can tell you that Sennheiser PXC-550 weights only 227 grams. But the weight difference is not that great that you will cry for! mathematically speaking Sony are 10% heavier than Bose!! Now coming to the long duration wearing comfort … Sony XM3 have slightly shallower cups, creating a warm feeling after long time wear .. so many people and websites have rated Sony negative due to sweating issues. This is may be because the ear-cups touch the ears after wearing ..
After you talk on wearing comfort .. second thing that comes to my mind is about operating the headphones using controls like volume up/down, ANC on/off, skipping tracks etc. In this case Sony scores pretty good using their high tech super intuitive to use touch controls, however some kind of learning will be needed to operate these headphones. Bose have traditional button controls, but they are also easy to use kind. In this case no learning needed since the controls are kind of proven method for headphones over ears. As compared to Mark 2 Sony has improved in the touch control sensitivity, maybe due to change in the texture on ear-cups. Both of these headphones do provide voice assistant, Sony has only Google assistant whereas Bose adds Alexa too. Another factor discussed over length across internet is about the battery life, now this is mainly due to laziness of anyone to charge headphones and the mobile phones! Yes, honestly as per me it has got nothing to do with how many house one uses it in a day .. to my experience even in the longest flights .. you can really use the headphones to 5-6 hours and not more than that! so why do people bother about longest battery life is only they are too lazy to put the headphones for charging! Sony uses latest USB-C thus providing fastest charging method as against BOSE using old micro-USB charging port. Both have cable provision in case the battery turns down. Both headphones do not work while charging, so you can’t listen and charge at the same time. So Sony regains life of 5 hours with just 10 minutes of quick charge! Most commonly I want to see movie on my iPad during train travel and when I get a phone call then I don’t really want to put off my headphones to simply take a call from my iPhone! So in this case Sony is completely NO for me! Bose allows connecting two devices like an iPhone and iPad at the same time, hence I need not take off the headphones but simply talk over phone call by pausing my movie. In-general both headphones are good in terms of quality of sound they can deliver. relative comparison of sound can be done using dummy head .. but its not absolute .. since u can hear it through ur headphones ..
Bose has only SBC and AAC, however BOSE do deliver its own well balanced sound signature. Bluetooth range is not an issue for both headphones .. However reliability of Bluetooth for XM3 is better than QC35ii …. Sony features automatic active noise cancellation. XM3 NC can be more precisely adjusted to your personal needs .. this is over and above the automatic NC models based on the action you are doing .. I mean walking, sitting, travelling in an airplane etc. Sound Leakage – Can your neighbor listen to your headphones? Sound leakage from drivers is more in Bose than Sony .. so if you are listening louder then on Bose headphones . someone sitting nearby in somewhat silent area will be able to listen what you are playing. Of-course Bose is also better than many other competition headphones, but surely Sony wins the battle here. Bose provides more cleaner call quality during train travel than Sony headphones. Bose delivers comparatively clean crisp voice quality to the listener at other end, which is desired and liked by me. I will say Bose is something near to True sound. Bose allows sharing music across two bose headphones using the app, hence if I want to see a movie during my plane travel alongwith my wife, I am able to do it using Bose headphones. However Sony does not have such music sharing option as well as it does not allow multi-point connection. Which means only I will be able to see the movie! or while I see the movie I can’t take a call over headphones! Both are foldable and portable. 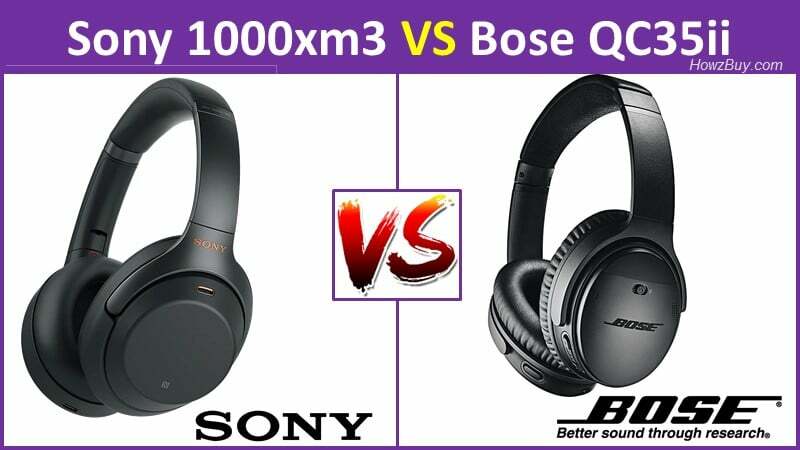 So in this case Sony vs Bose .. both scores the same. And finally I must touch upon the most infamous issue of Sony XM1 and XM2 headband breakage issue. This has been discussed over internet world for a while and I have not found Sony commenting on this issue anywhere on this earth! But the fact is that many many complaints about the Sony XM series on headband breaking in short duration making the $400 headphones useless in a while! However many websites including RTINGS.com have mentioned that Sony XM3 has improved and better headband design than M2’s which will surely resolve the headband breakage issue! lets see, how it goes. If you like high Bass … LDAC quality high tech sound .. then go for Sony .. Great for movie watching and rock ..
for someone upgrading from XM1 .. XM3 would be surely YES, but upgrading from XM2 to XM3, I will not insist on. Easy to listen .. easy to wear .. lot of calls .. sharing music with your friend / watching movie with your love … Bose is the best ..